A friend of mine got a new camera and I jumped at the chance to try out his camera over the weekend! Thank you Hasse! 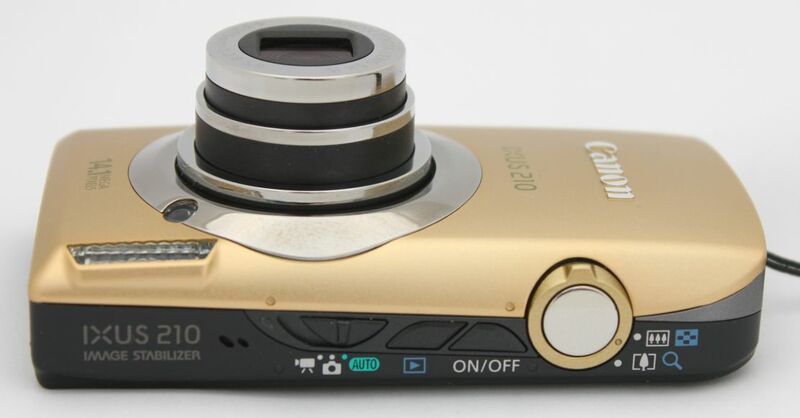 The camera is a Canon IXUS 210 IS (also called PowerShot SD3500 IS). It has a much more oblong form to it than for instance the Canon S95. This particular camera was “gold” coloured – rather classy I think. The metallic finish sorts of gives it an air of “dress camera” – something you would bring to a posh party – wearing smoking or a long dress. I must confess I was a little taken in by this little beauty of a camera… so well-shaped, so sleek… I will of course be comparing it to the Canon S95 and using the Canon EOS 550D as a reference. As usual I will not cover every small detail and every feature of the camera so I will refer you to Bing&Google to find more info, But I will have samples to compare(!) and I will give my view on some of the (to me) most important features. As I will have it just for a few days my review will concern what I see with my “new user” eyes – and I will take all the sample pictures and try to find out what I like and do not like about the camera. I am starting it off today and will probably write this blog post over a few days time. Starting from the top the is where the camera has all of its buttons and switches. From the left and moving right we first have the button for camera mode: movie, program auto and full auto. This is a slide switch and it is very easy to “overshoot” when you move it to the right or to the left – making it very easy to either use movie mode or full auto mode – but slightly more difficult to set my favorite mode the programmed auto mode – that is situated in the middle. Not the best of solutions but it is no catastrophe either! This might very well be intended for the group this camera is designed for! Easy to select full auto and movie but more difficult to select program auto! Then is the button to view the pictures (the standard blue/green triangle) followed close by by the power on/off. All of these buttons are rather oddly shaped triangles. They work as they should and I just see them as having had their fair share of “design” applied to them. 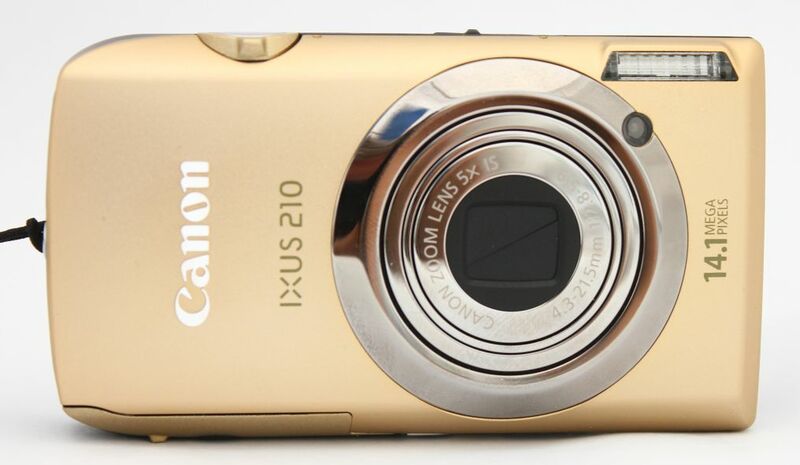 The IXUS 210 is a fast starter – in under one second it has extended its lens and you can start taking pictures. Finishing of the buttons is the big metal shutter release button and the ring around it with its small bump serves as the zoom lever. 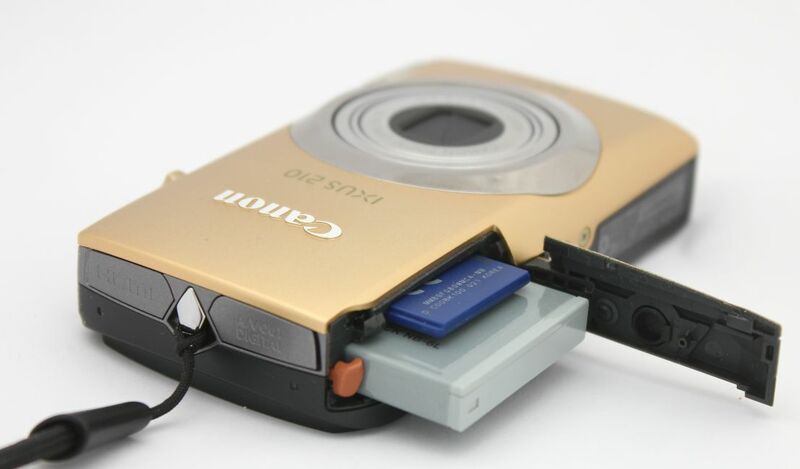 The shutter release button is very smooth and has a proper pressure point so you will know exactly when the camera will focus and when it will take a picture. The zoom is also a fast worker – zooming from wide to tele in around just two seconds. The lens actually has its minimum size halfway between the wide and the tele setting. That was it! ALL of the buttons on this camera! This is also the reason why I was so excited to try the camera out – it has a touch screen! With touch screens being everywhere; Apple iPods, iPhones and iPads I wanted to see how well such a user interface would work on a camera. Cameras often having another more important (?!) mission than just being a “viewing device” – you should be able to take pictures with a minimum of fuzz! I will now jump to the bottom of the camera and keep the screen till last. It has a metal (good!) tripod screw thread slightly off-center from the lens. Ideally you would like to have it in the centre of the lens so that – if you mount the camera on a tripod – you would rotate the camera around its optical axis. That would have been an advantage if you take panoramic shots for instance. I do not think any camera maker would place it anywhere but in the centre if they could. So I must assume that tight space does not allow it to be placed in the centre – maybe the lens mechanism takes up all available space. This will have to do for today – I will hopefully resume my writing tomorrow – with the screen!